Exactly what I thought when I saw it. 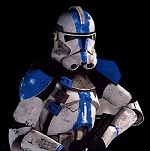 501st_commander wrote: Yes it is. Emo skin thing. I used to use this, but not any more. Apparently people love this. I think it's sort of creepy. But it goes beautifully for Nether exploration, if you want to fit in with the zombie pigmen and netherrack. The inverted form of what I have above. Tundra biomes FTW. 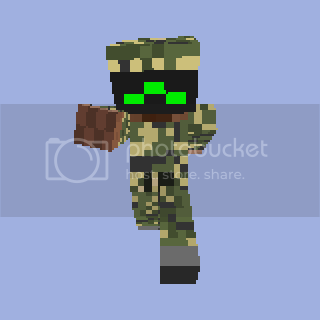 This is the skin I use. The other two are edits of this one, I just adjusted the color filters. Also, planet minecraft lets you preview your skins on the player model, so I use them. And they rock. Thanks for the comment Bob! I really appreciate it. 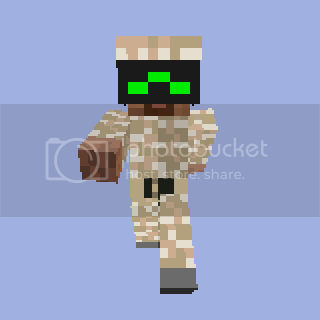 I have made some Camo Block that you can paste on your Characters Image. Thats what they look like with all the different parts I made.